Vivid and elegant,blooming for generations. Take a relaxing holiday and enjoy the Azaleas and Rhododendrons at Lake Ashi. experience and a view of Lake Ashi. we have improved our hospitality for a long time at this beautiful natural scene. 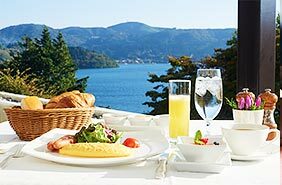 The authentic resort hotel "Hotel de Yama" boasts the best location on the lakeside of Lake Ashi. We were originally the villa of Baron Koyata Iwasaki, whose uncle is Yataro Iwasaki, the founder of Mitsubishi. Since 1948, we have followed the baron's philosophy toward hospitality for guests within and outside the country, and the hotel still maintains the classical atmosphere. The nature that was passed down to us provides high quality hospitality. Over 60 years since our founding, Odakyu Hotel de Yama has made a renewal opening in 2015. We maintain our charm and history while our staff provides the best service. Whether you are here for lodging or day trips, Hotel de Yama will provide an extraordinary day for you. The beautiful and ever-changing Lake Ashi can be enjoyed from all the guestrooms. Relaxing at this historical Hakone hotel with each floor with a different design and enjoying the resort life is something to look forward to. 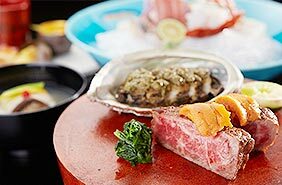 CUISINE Enjoy the beautiful scenery with gourmet traditional cuisine. The French restaurant "Vert Bois" and Japanese restaurant "Tsutsuji no Chaya" are great places for lunch with friends, dining, wedding parties, special occasions, or even private dining. Enjoy our famous in-house hotspring of Lake Ashi in our classic and authentic space. Our "Bihada no yu" will revitalize your skin with its alkaline simple hotspring. Our grand 130,000m² garden by Lake Ashi has Mt. Fuji as its backdrop, providing a wonderful view whether it is spring, summer, autumn, or winter. Our carefully trimmed garden has walkways for you to enjoy its history throughout the four seasons. Not too far from the big city, Hakone is a popular tourist destination where you can enjoy history and nature. Hotel de Yama is close to many famous locations in Hakone. We hope you will enjoy the town of Hakone to your heart's content. Copyright 2019 HOTEL DE YAMA. ALL Rights Reserved.